Our Sugar vs the Reef? exhibition at Artspace Mackay recently ended, and we have lots of stuff to share from that show. 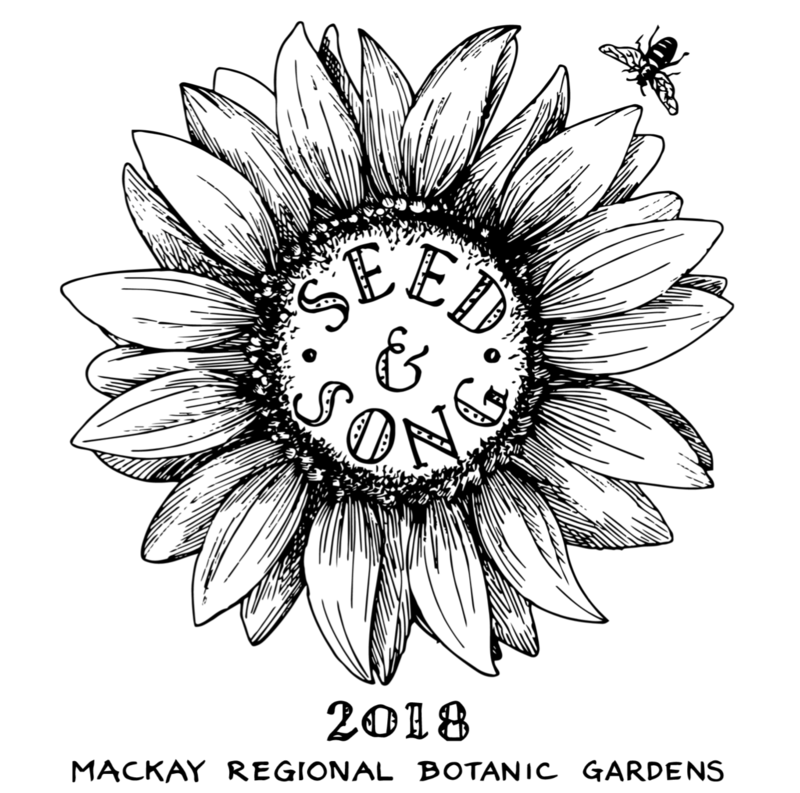 Here’s a video snapshot of the SEED & SONG planting day from August 2018 at the Mackay Regional Botanic Gardens. 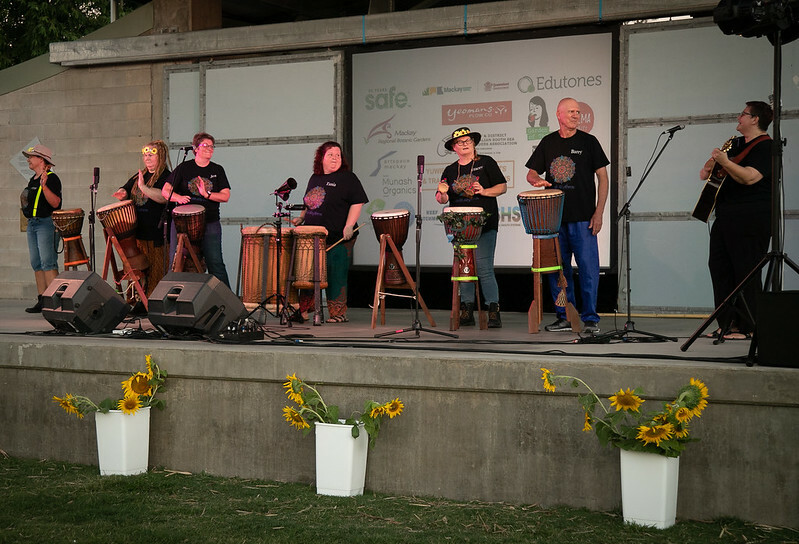 On that day, a host of collaborators came together to sing, dance, eat, drink, and plant sugarcane and sunflowers. Local film maker Willem Reichard shot the footage, and our friends from Wayward Films edited it together. The song which weaves throughout the video is “The Planting Song” by Kim Williams, which she has been developing over the course of the whole project. It started as “The Legume Song” (when we planted legumes in February 2018), and later (in November 2018) became “The Harvest Song” – same melody with an ever-evolving lyric sheet! This version was recorded by the wonderful Dave Sheldon at Tin Shed Studio in Mackay, with the voices of Fiona, Oni and Alec Vuibeqa, Susie and Sophie Mattsson, and of course Kim and Lucas. In the evolution of any botanical project, things live and die. Different species have different lifespans, and each has its moment to shine before moving aside to make space for the others. Over the course of this year, the stars of the Watershed Land Art Project have been legumes (like cowpea, vetch, lucerne, and the wonderfully named dolichos lablab) as well as cover-crop plants like fenugreek and buckwheat. All these species lasted a season and were then mulched back into the earth. This cycling is a way of working with plants to improve the soil (particularly building nitrogen and organic matter and reducing compaction) in preparation for the main event: our dual crop of sugarcane and sunflowers. In fact, while sunflowers attract a lot of attention, the sugarcane is the heart of the matter. With over 2000km of sugarcane growing along the Queensland coast adjacent to the Great Barrier Reef, and much of it happening in monoculture systems, there has been intense pressure for the industry to reduce its environmental impact. Growing sugarcane as a monoculture requires chemicals – artificial fertilizers and bio-cides. More chemicals in the system means more floating around in the run-off that inevitably washes out from farms, into creeks and out to the reef. So The Beacon – our 30 metre diameter plot at the Mackay Regional Botanic Gardens – is a mini-demonstration farm showing how sugarcane can be grown as a polyculture. Sharing space with the Botanic Gardens means that The Beacon is a work of public art – available for the inspection and pleasure of the public at any time of the day or night. When a project takes 18 months to evolve, opportunities present themselves for seasonal celebrations. Planting becomes a ritual and a pleasure that kids can be part of. Singing and dancing and feasting and talking are re-integrated with the processes of agriculture. And the moment of harvest – tapping into centuries old human traditions – becomes a chance to let your hair down and reflect on what has been achieved. That’s why the sunflower harvest event was so important for the Watershed Land Art Project. The sunflowers had finally burst into full bloom. So many different groups and individuals have been involved in building The Beacon – and now they all came together under a big full moon on 23 November 2018. As folks were arriving (about 6pm, towards sunset) the wonderful Zenith Rhythms started to play on the amphitheatre stage. People laid out their picnic blankets and their folding chairs and got settled in. At half past six, Yuwibara Elder Veronica Ah Wang took to the stage and invited the crowd (about 250 people!) to move up to The Beacon. Uncle George Tonga had organised a smoking ceremony, and everyone passed through the fragrant smoke on their way up the hill. 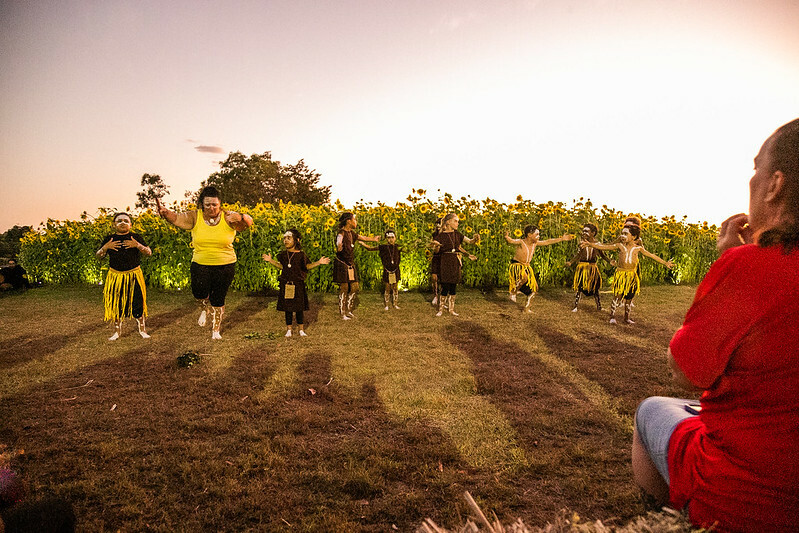 When the crowd arrived, the Diranga Gangali group led by Aunty Deb Netuschil “danced us in” to the event, emerging from the blooming sunflowers to tell stories in movement and song about the Yuwibara people’s histories, and the animals of this country. Then came the time to harvest the sunflowers. We performed Kim’s “Harvest Song” accompanied by ukuleles and local singers. Our farmers stepped forward, teaming up with a gaggle of local kids. The farmers cut the stems, one at a time, handing them to the children. Each child slowly moved through the crowd handing out the flowers. This ritual continued until everyone had at least one sunflower. The Diranga Gangali Dancers then led us back down to the amphitheatre where we projected a joyous slideshow put together by Cherrie Hughes, showing how The Beacon has evolved throughout 2018, from depleted soil to fecund farm. On marched the Sakwolo Islander Dancers, who took to the stage in a new set of glowing white outfits in a riotous celebration choreographed by David Tass. The evening moved into a soil education mode, with a presentation by Katrina Dent from Reef Catchments, who linked Sunflower and Song to the Healthy Soil Symposium that had taken place that day. Our public discussion about the relationship between soil health and the Great Barrier Reef continued with a performative dialogue between regenerative farmers Simon Mattsson and Gary Spotswood. This was reinforced by a screening of the documentary film Sunset Symphony in the Sunflowers (2017), which demonstrates how cultural and agricultural practices can work together for environmental benefit. The evening was rounded off by an intimate solo musical performance by Woodbridge – after which the crowd moved off into the night, and we began to stack up the hay bales and pack up the bunting. Sunflower and Song was marked by three layers of “activation”. The space was activated (the amphitheatre, the botanic gardens, The Beacon) with movement across the site. People were activated (farmers, local traditional owners, Australian South Sea Islanders, natural resource managers, council staff, artists, food producers and cultural producers). And there was an activation of biodiversity – not only visible above ground, with the sunflowers and sugarcane and the bugs and bees, but also underground, with the worms and nematodes and fungi and microbes. It has been a privilege to learn about all these plants, places and people. 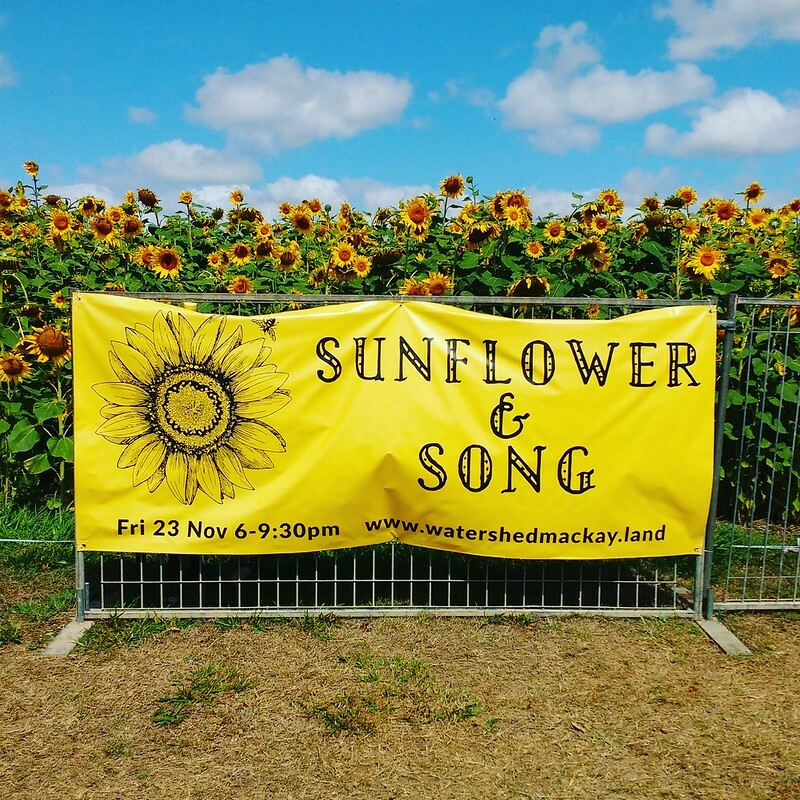 Mackay is home to extraordinary potential, and at Sunflower and Song we had a small glimpse of that. 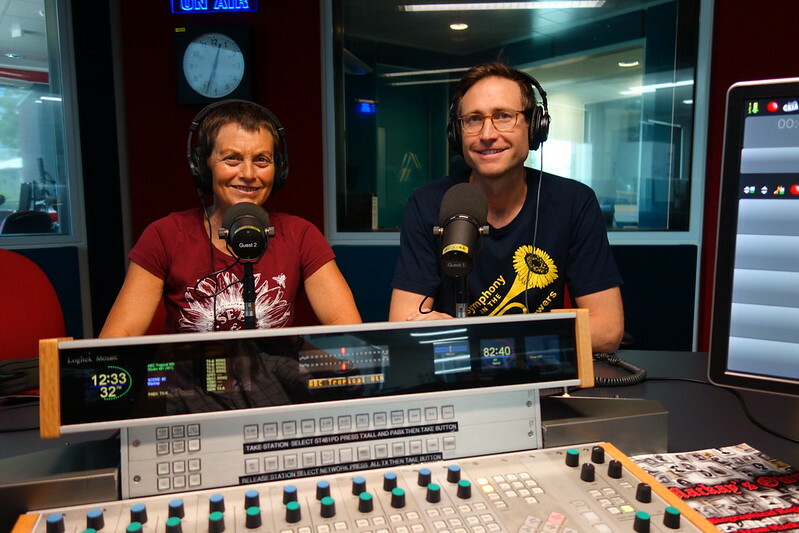 In the lead up to our Sunflower Harvest Event in late November 2018, Tegan Philpot from ABC Tropical North invited Kim and Lucas to come in for a radio interview. Thanks Tegan! A glorious field of sunflowers is in full bloom right now at the Mackay Regional Botanic Gardens. 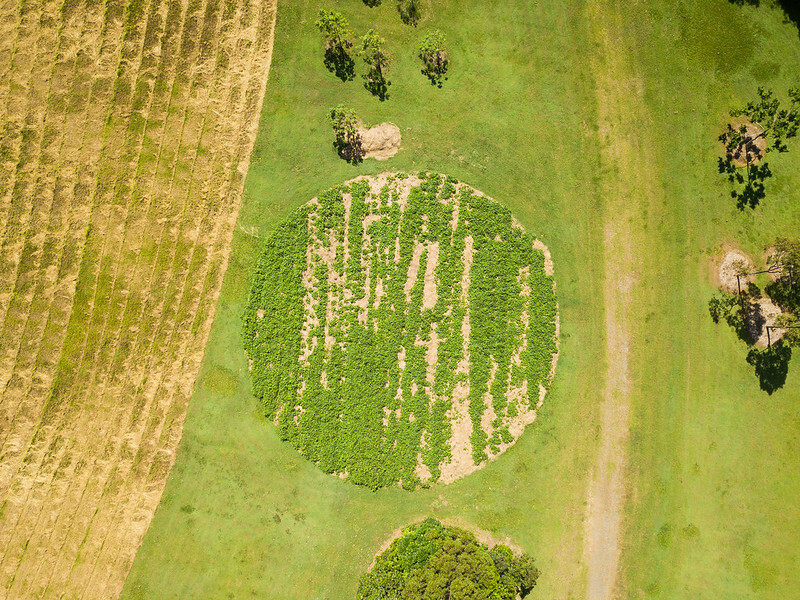 The brainchild of Wollongong artists Lucas Ihlein and Kim Williams and Marian farmer Simon Mattsson, this cheerful crop – nicknamed “The Beacon” – is both a stunning work of Land Art and a demonstration of farming innovation in the Mackay region. This has been a hard year for agriculture in Australia. Widespread drought has increased pressure on farmers who are striving to be environmentally friendly and stay profitable. With increasing weather uncertainty due to climate change, it’s more important than ever for farming innovations to be shared and celebrated with the whole community. 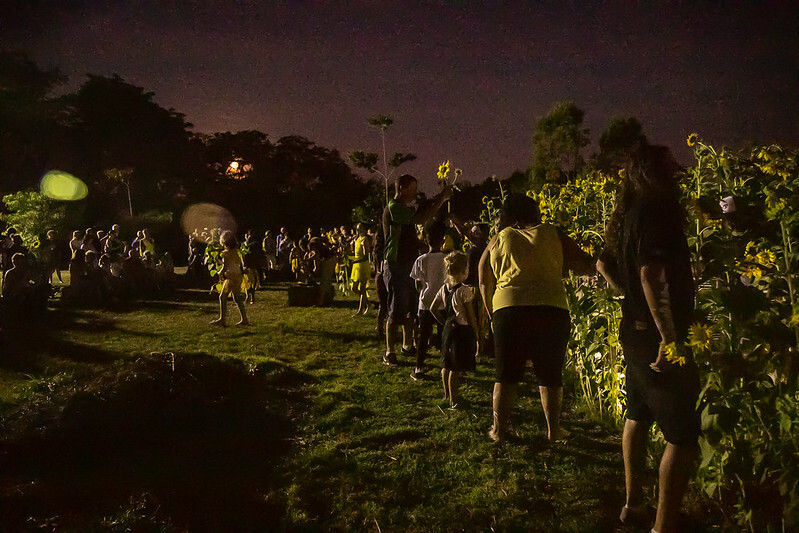 On the 23rd November, the artists and farmers will host Sunflower and Song – a community celebration where the sunflowers will be harvested alongside music, dance, and good food. The event starts at 6pm and features the Diranga Gangali Aboriginal Dancers, the Sakwolo Islander Dancers, Woodbridge, and Zenith Rhythms. 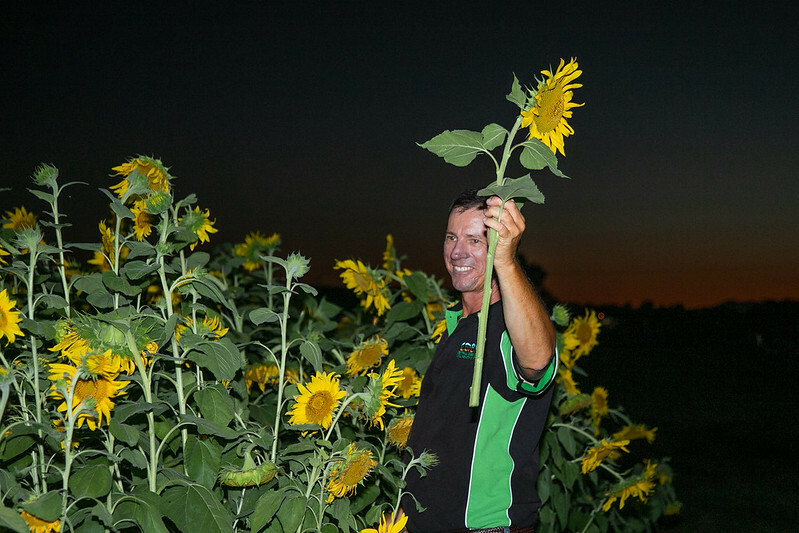 Farmer Simon Mattsson will discuss soil health, and the artists will screen a documentary about Sunset Symphony in the Sunflowers, an event which was launched with great success last year at the Mattsson family farm. 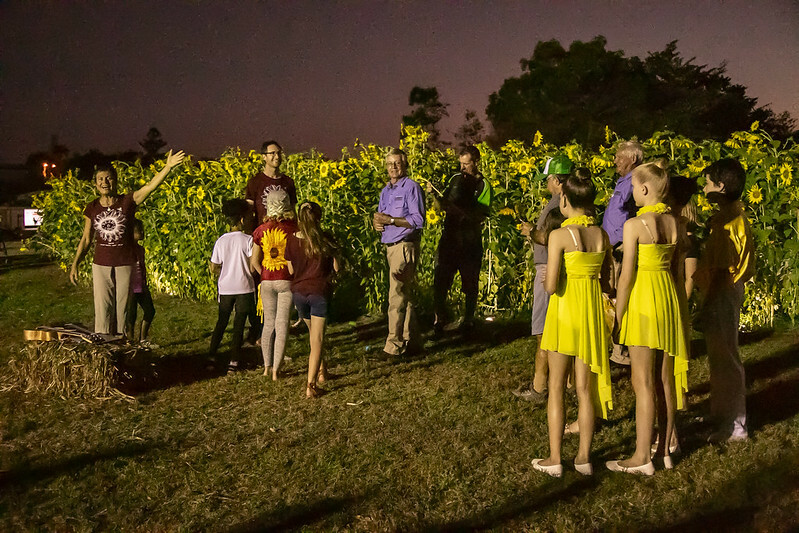 Staging events like Sunset Symphony in the Sunflowers, and now Sunflower and Song at the Botanic Gardens, is a way to bring farmers and the wider public together, raising awareness of exciting new ecological farming methods being developed within the Queensland sugarcane industry. 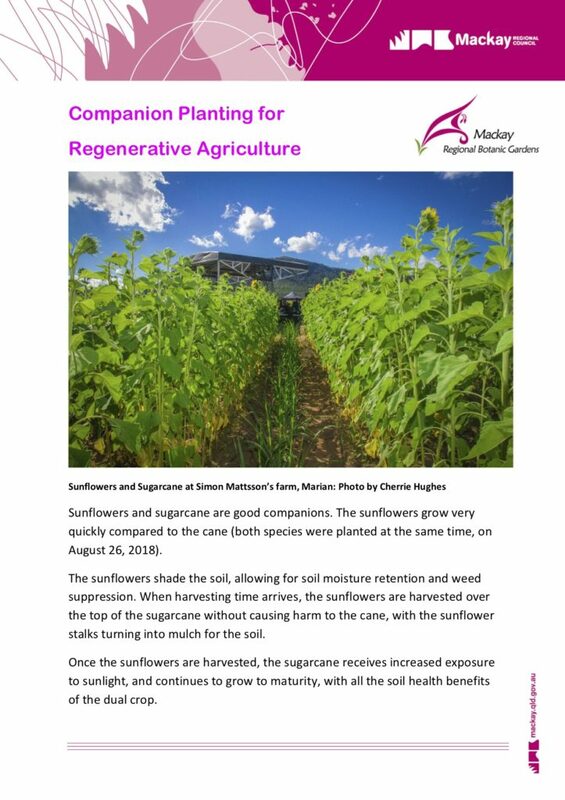 Sugarcane and sunflowers help each other by supporting a wide variety of soil biology, which means better outcomes for both. If both species grow healthier then there is less need for the farmer to use chemicals to fix problems. 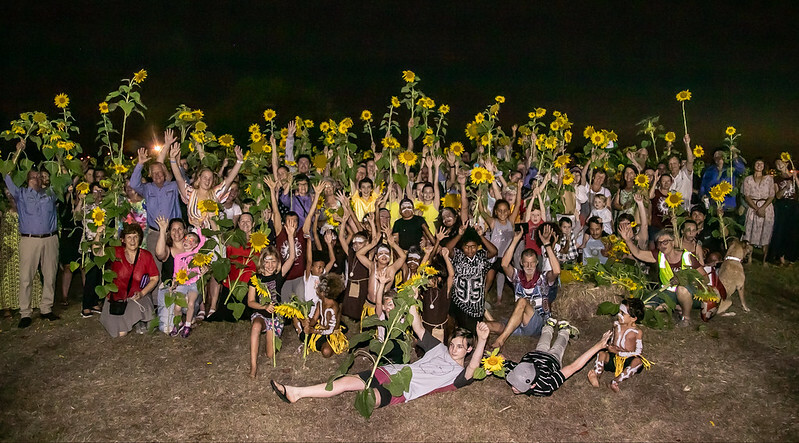 Community and environment groups associated with Sunflower and Song include Mackay Regional Botanic Gardens (MRBG), Mackay & District Australian South Sea Islander Association (MADASSIA), Yuwibara descendants and traditional custodians, Central Queensland Soil Health Systems, the Great Barrier Reef Marine Park Authority (GBRMPA), Pioneer Catchments and Landcare, Artspace Mackay, Australian Farmers for Climate Action, Mackay Conservation Group, Reef Catchments, and University of Wollongong. 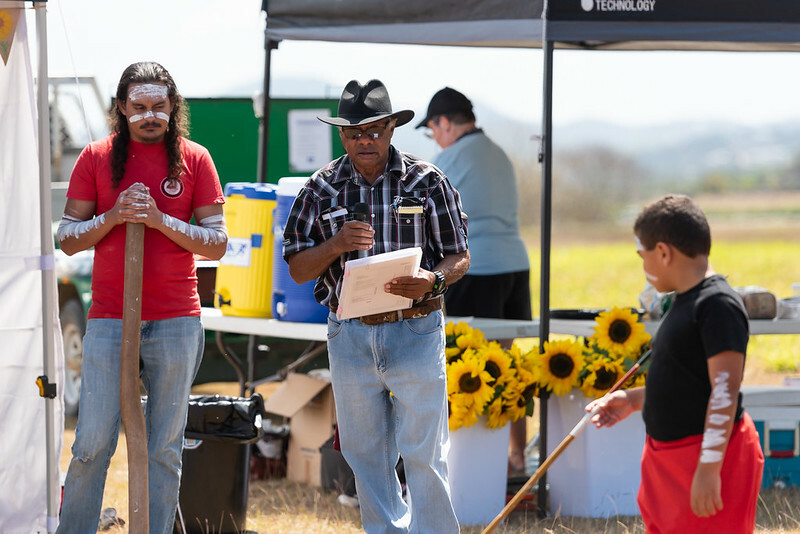 The contribution of these organisations to the Sunflower and Song harvest event, which is a part of the Watershed Land Art Project, shows the level of co-operation between many local organisations who are working towards a healthier environment. Meanwhile, Ihlein and Williams are presenting a major exhibition at Artspace Mackay called Sugar vs the Reef? On show are botanical drawings, maps and diagrams, videos and photographs of the crops growing at the Botanic Gardens. The exhibition continues until 27 January 2019. 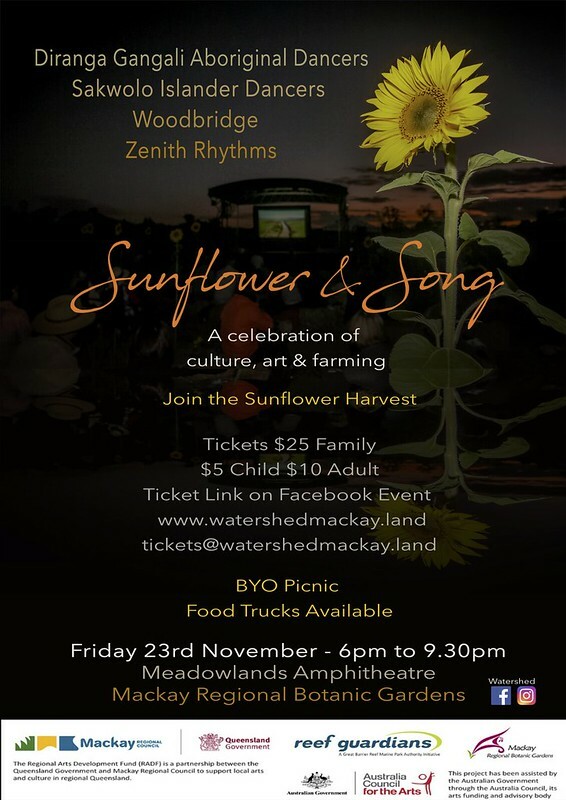 More information can be found at the Watershed Mackay Facebook page. Here’s the latest signage we’ve installed at The Beacon to explain the benefits of the dual crop of sugarcane and sunflowers. You can download a PDF of the signage info here. 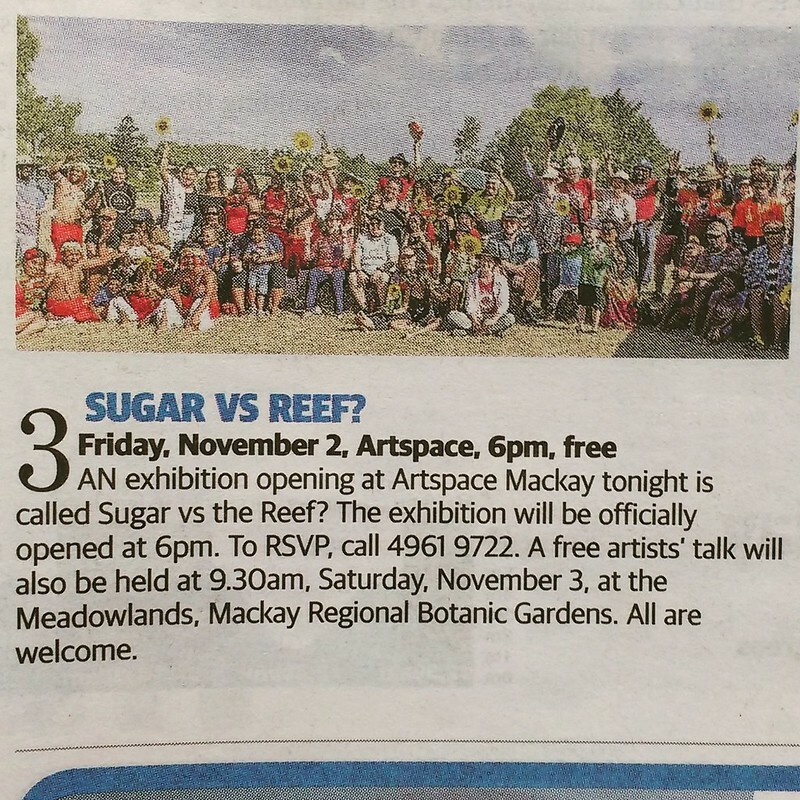 An exhibition opening at Artspace Mackay tomorrow is called Sugar vs the Reef? However, the theme is not one of conflict, but rather in-depth collaboration. Wollongong artists Kim Williams and Lucas Ihlein have been visiting the Mackay region since 2014. Over that time, they have sought to gain a deeper understanding of the sugarcane industry and investigate how artists and farmers can work together on large-scale ecology problems. Cr Fran Mann said Sugar vs the Reef? was a culmination of that investigation and a showcase for a larger body of work that included a series of large-scale art installations and events. 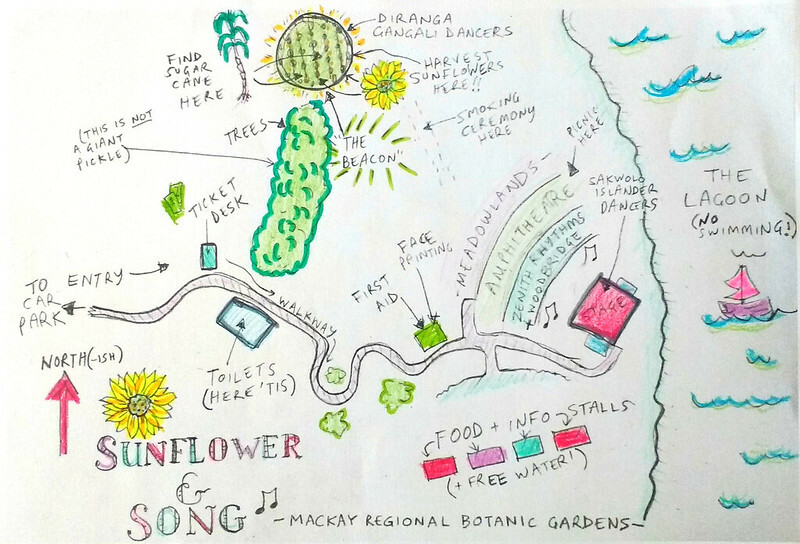 “The two projects that residents would be most familiar with are the ‘Sunset Symphony in the Sunflowers’ event on the Mattsson farm in 2017 and the current and ongoing project ‘Watershed Land Art’ at the Mackay Regional Botanic Gardens,” Cr Mann said. “Lucas and Kim describe their arts practice as ‘socially-engaged’ art, meaning they see the process of engaging and collaborating with communities as the most important aspect of their work,” she said. 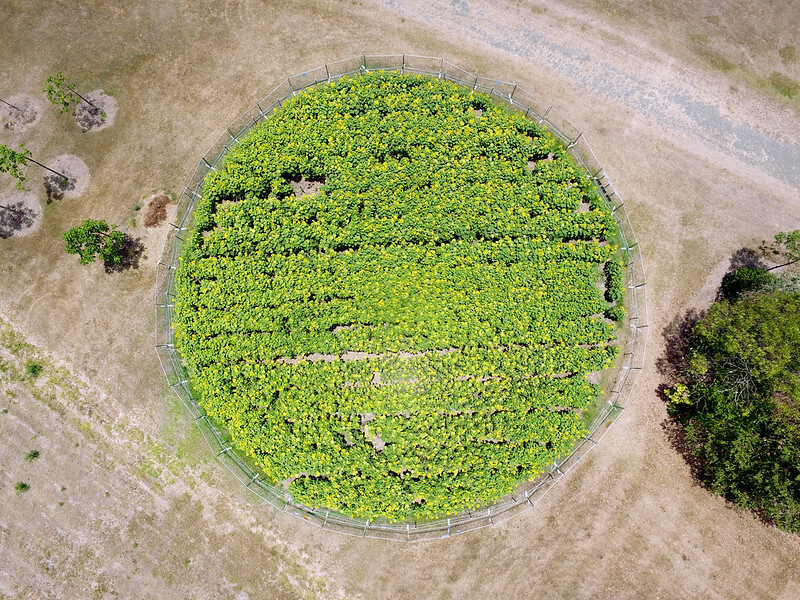 “The Watershed Land Art Project is a great example of this – to create ‘The Beacon’, a 26-metre diameter demonstration farm at the Botanic Gardens, they have worked with a huge cross section of the community. 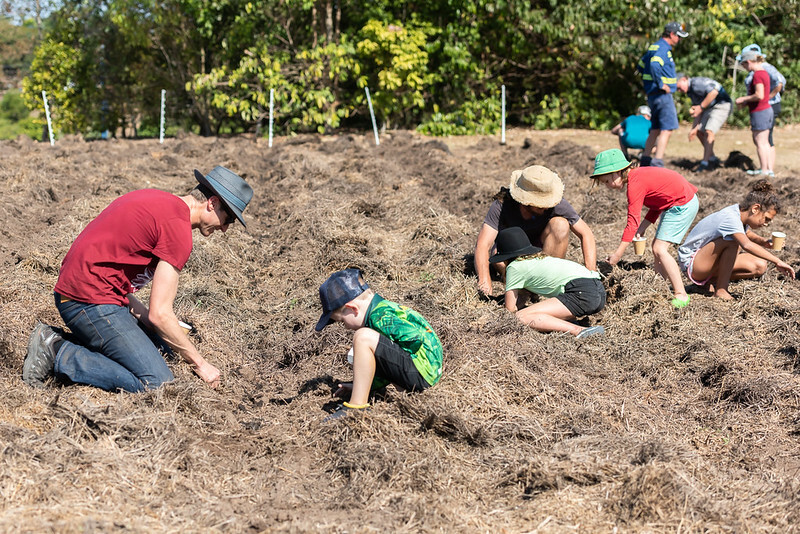 “They worked with local farmers to explore and promote regenerative agriculture practices while also creating stunning land art, and this then has a flow-on benefit to water quality and the Great Barrier Reef. 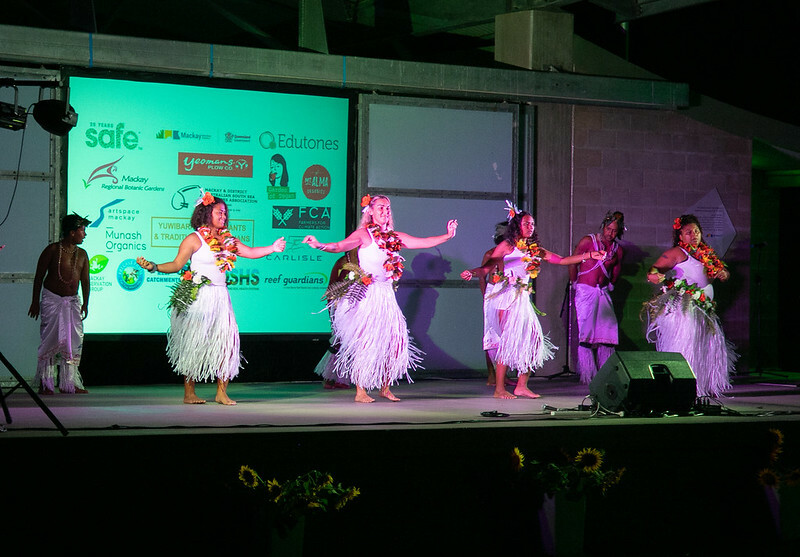 “More than that though, through the different phases of the project they have also celebrated the contribution of the Australian South Sea Islander (ASSI) communities in the sugarcane industry in Queensland. To learn more about the collaborations forged by Kim and Lucas, residents are invited to meet the artists at the exhibition opening tomorrow (Friday, November 2). A free Auslan-interpreted artists’ floor talk with Lucas Ihlein and Kim Williams will be held at 5pm in Gallery Three of Artspace Mackay. The exhibition will be officially opened at 6pm by Jeremy Smith, Director Community, Emerging and Experimental Arts from the Australia Council for the Arts. To RSVP, please call 4961 9722. A free artists’ talk will also be held at 9.30am, Saturday, November 3, at the Meadowlands, Mackay Regional Botanic Gardens. All are welcome. We always envisaged The Beacon as a way of bringing culture and agriculture together at the Mackay Regional Botanic Gardens. 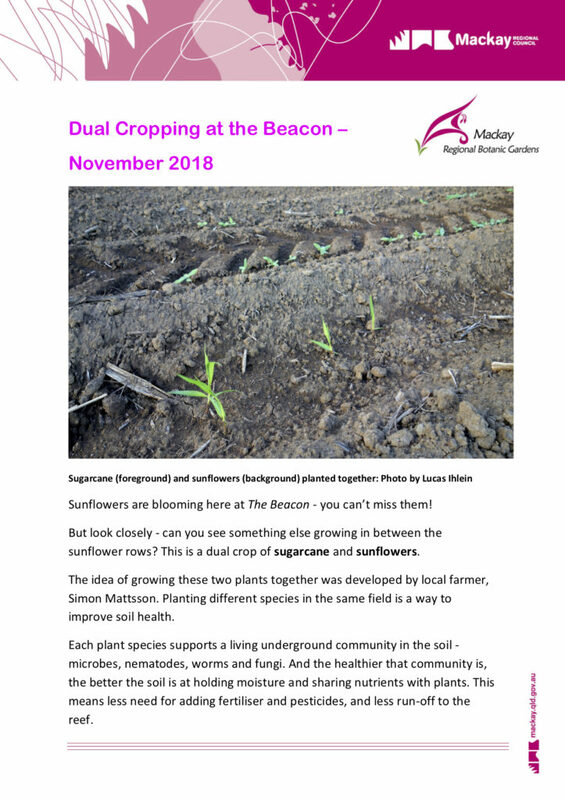 At the most basic level, The Beacon is a 26 metre diameter demonstration farm, showing how you can have diverse plant species living alongside sugarcane. So, we needed to put some sticks of sugarcane into the ground, and we had to plant a bunch of sunflower seeds in straight rows – two purely practical tasks. But we wanted to make these tasks special, by creating some meaningful rituals around what might seem a relatively straightforward farming activity. 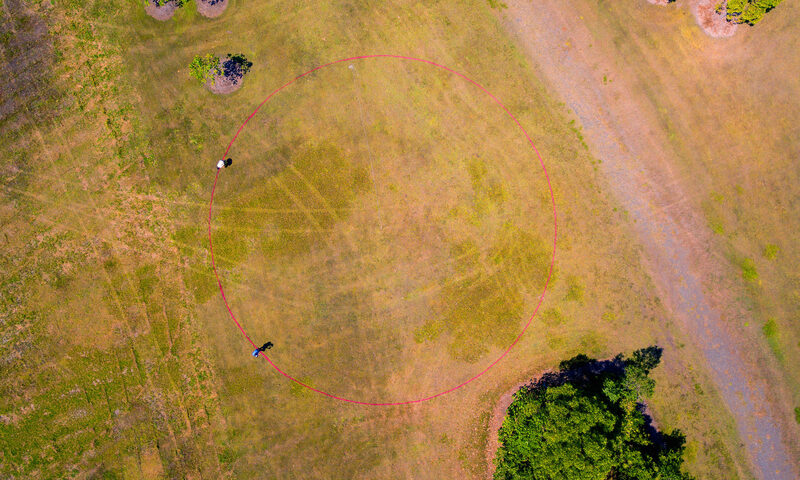 Our planting site is located on “public” land at the Botanic Gardens, which gives us the chance to bring a range of different people together, gathered around this circle of soil we’ve been tending with great care since February. While working with the soil, we’ve also been cultivating friendships and working relationships with the Yuwibara people, the traditional custodians of the Mackay region. Even though the Botanic Gardens is on land owned by the Mackay Regional Council, who give us permission to plant and dig, at a deeper level it is the Yuwibara Aboriginal Corporation that we turn to, to ask for permission to work, to dwell, to plant. Uncle George Tonga performing the Welcome to Country at the SEED AND SONG event in August 2018. At the left is didgeridoo player Lyndon Francis. Uncle Phillip Kemp and Uncle George Tonga have been very supportive, and through them we’ve been beginning to learn about some of the histories and cultures of this place. This is especially important since Kim and I live in Wollongong, on Wodi-Wodi and Dharawal lands, hundreds of kilometres to the south. We’ve also recently gotten to know Aunty Deb Netuschil, who choreographs the Diranga Gangali Aboriginal Dancers. At our recent SEED AND SONG event, these local kids “danced us into the day” with a set of fantastic moves accompanied by the talented Lyndon Francis on the didgeridoo. Crucial to our work at the Beacon is our relationship with MADASSIA, the Mackay and Districts Australian South Sea Islander Association. Without Starrett Vea Vea and Jemal Davis, and their team at the Community Hut located nearby, none of this tending would be possible. The fact that Jemal is on site every day with his work crew is the single most important thing helping the dual-crop grow and thrive. Jemal Davis (orange shirt) with Uncle Doug Mooney (right) planting sugarcane at The Beacon. Far left: Uncle George Tonga applying natural fertilizer. As the chair of MADASSIA, Starrett jumped on board from the very beginning, recognising that a project about sugarcane has the potential to tap into the some important stuff for his community. The South Sea Islander people have an indelible relationship with the establishment of the sugar industry in Australia. Without their yakka – which began as slavery, (and was sometimes called “indentured labor”), the economy of a huge area of Queensland today would not be so heavily based around sugarcane growing and processing. At SEED AND SONG, Starrett invited Uncle Doug Mooney, an elder in the ASSI community, to come along and share some of his stories about working with sugarcane by hand in the old days. When we organise an event like SEED AND SONG, we think about how to shape the experience of the participants on the day. We try to bring together a whole mix of elements – fun, food, learning, work and entertainment. We’ve loved working with the Sakwolo Islander Dancers – who perform in their gorgeous costumes designed and handcrafted by their choreographer and visionary leader David Tass. Their work connects the yakka of agriculture with the rituals of contemporary Australian South Sea Islander culture. 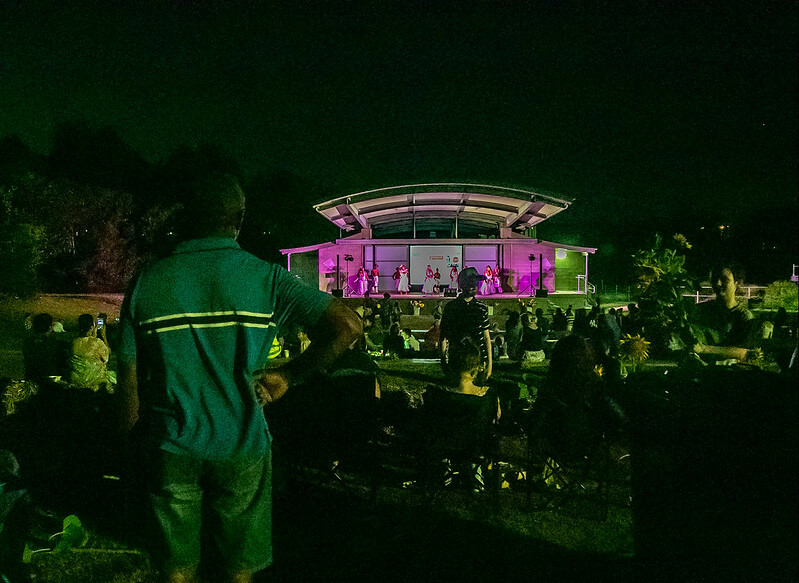 This year we received events funding from two sources: The Great Barrier Reef Marine Park Authority (GBRMPA), through their Reef Guardians program; and the Queensland Regional Arts Development Fund (RADF), through its “Green Arts” program. Both these programs encourage innovative cultural activities which have ecological benefit. Kate Finch (right) from GBRMPA attending the SEED AND SONG event with her kids. We’ve been collaborating with GBRMPA, and its Local Marine Advisory Committee (LMAC) for several years now as we develop our work in Mackay. 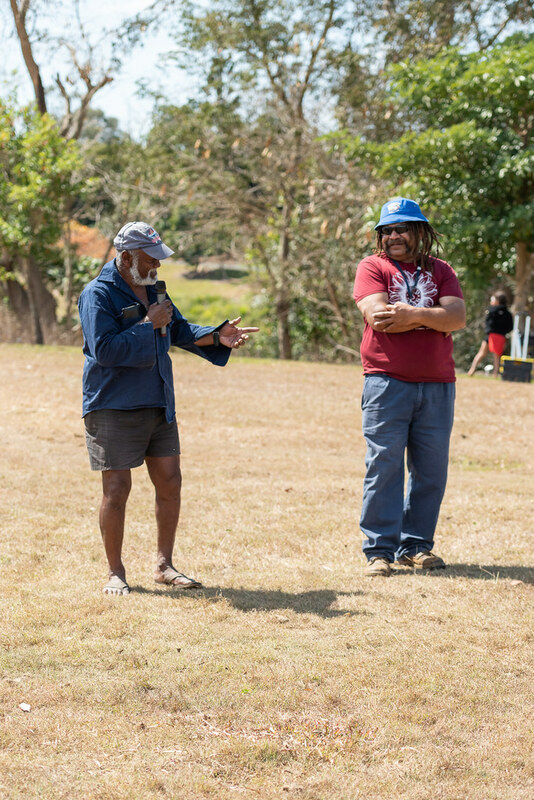 Our approach has always been to celebrate the achievements of leading farmers in the sugarcane industry, and to create cultural events which help to share soil-focused farming ideas with the wider community. 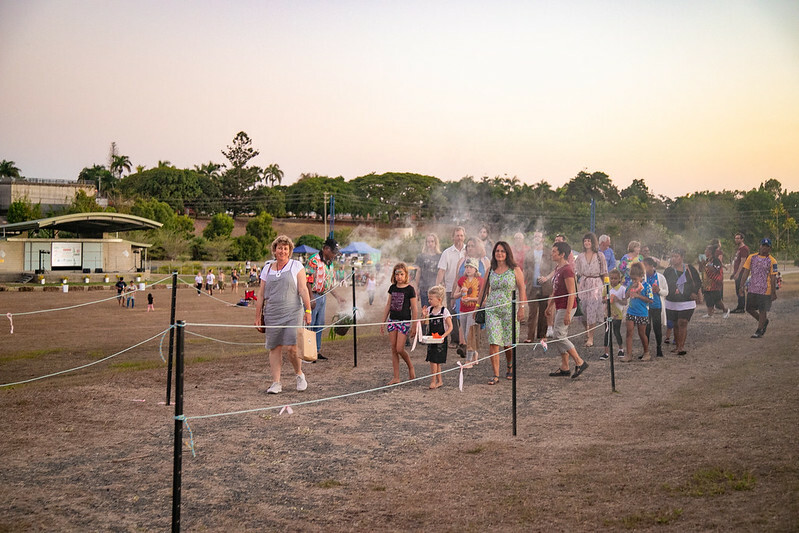 Similarly, our RADF contacts, like Fiona Vuibeqa from the Mackay Council, have been very supportive of this unusual approach to using art to bring together diverse people, like farmers and the ASSI community. The Beacon, in this sense, is a miniature “demonstration farm” – not only trialling and showcasing a range of methods which will help build soil, reduce chemical use, and cut down on the run-off which travels from the land out to the reef, but also testing out how land management can be done in a respectful, inclusive and cross-cultural way. This August in Mackay, get your hands in the soil and have fun celebrating positive innovations in local agriculture! 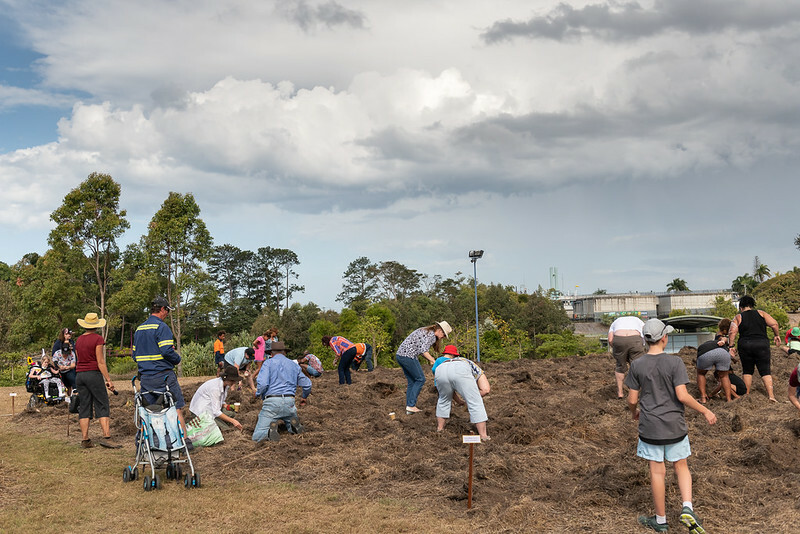 Award winning artists in collaboration with council and local farmers welcome the community to be part of the Watershed Land Art Project at the Mackay Regional Botanic Gardens. The project – a stunning circular crop of sugarcane and sunflowers – is a demonstration of local achievements in eco-friendly farming systems. On Sunday, August 26 from 12pm to 4pm join us for SEED AND SONG. 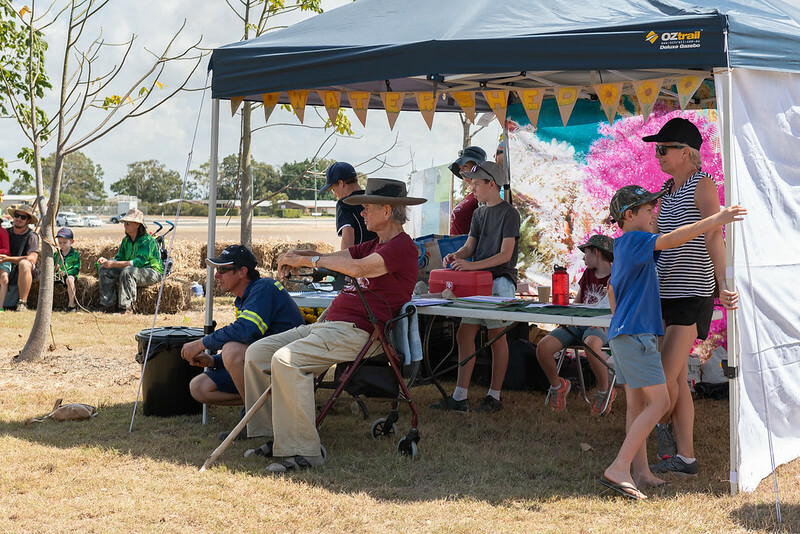 It’s your chance to help plant sugarcane and sunflowers, learn about soil health, and find out what farmers and the community can do to support the Great Barrier Reef and human wellbeing. The Diranga Gangali Aboriginal Dancers and the Sakwolo Islander Dancers will perform, and fresh sugarcane juice and local healthy foods will be served! 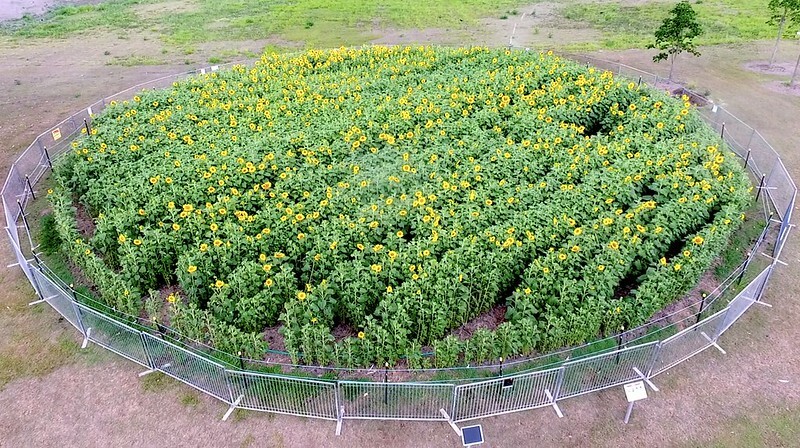 Following the August planting, this living work of art will continue to grow until the sunflowers bloom and a harvest celebration and concert is staged on November 24. 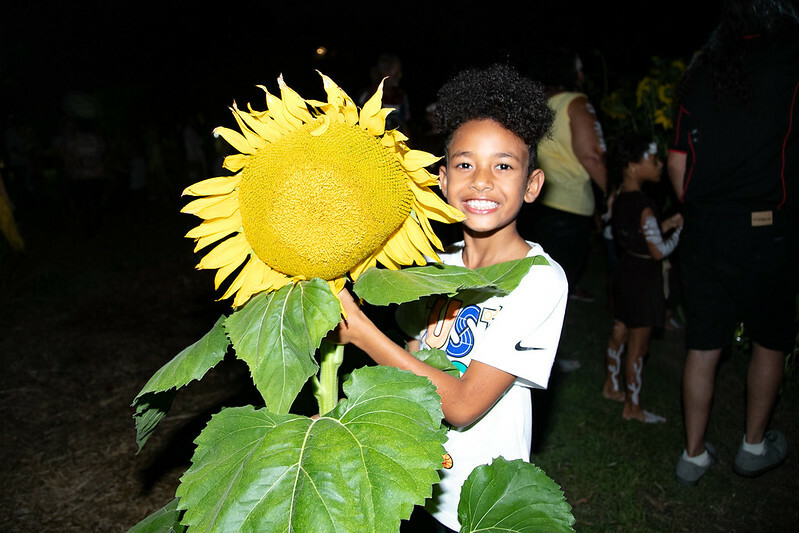 Staging events like Sunset Symphony in the Sunflowers, and the new Watershed project at the Botanic Gardens, is a way to bring farmers and the wider public together, raising awareness of exciting new ecological farming methods being developed within the sugarcane industry. Groups associated with the project include Mackay Regional Botanic Gardens (MRBG), Mackay & District Australian South Sea Islander Association (MADASSIA), Yuwibara Aboriginal Corporation, Central Queensland Soil Health Systems, the Great Barrier Reef Marine Park Authority (GBRMPA), Pioneer Catchments and Landcare, Artspace Mackay, Australian Farmers for Climate Action, Mackay Conservation Group, Reef Catchments, and University of Wollongong. Car parking on Crowleys Road, off Alexandra St.
Download the SEED AND SONG FLYER. Coming up in Mackay – this excellent event, hosted at the farm of Simon Mattsson, one of the key agricultural collaborators on the Watershed Land Art Project. THIS FIELD DAY IS FREE FOR LANDHOLDERS, with funding provided by Farmers for Climate Action. Cane farmers, graziers and landholders are invited to learn more about methods being trialled by local farmers to build farm resilience and help counteract climate conditions and declining soil health.